Rock has three informative posts today. One on MLK, of course. Must read, natch, especially today or this week. Liturgy geeks can ponder the latest ICEL adventures just outside “Middle Earth.” Should they care to do so. Catholic gossip hounds can scratch their heads in wonder at news on various episcopal ordinations pouring from Rock’s new ‘puter before hitting cathedral steps in advance of Lent. 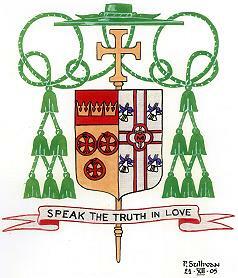 The botanist in me couldn’t resist noting the appearance of four columbines on Bishop Nickless’s Sioux City coat of arms. Lookee over there on the right side of the shield. Deacon Paul Sullivan explains it for the northwest Iowa faithful: it’s the state flower of the new bishop’s old state. Thanks to two gun-toting teens, and perhaps a liberal filmmaker, “Columbine” has more negative connotations when we hear it today. But it remains a lovely aspect of God’s creation. The columbine is a pretty cool plant. It has “spurs” for creating a nectar reservoir for visiting insects. Not for “spurring” on the horses. Or the faithful. 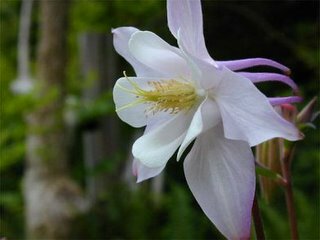 Photographer Amy Rothstein has this image of columbines reminiscent of kites in flight. Here’s hoping the new bishop’s ministry takes off in flight despite a rocky start. This entry was posted in Church News, Commentary, Liturgy, Science. Bookmark the permalink.